Prepping for Winter? So Are We! As we get ready to flip the calendar to December and an icy chill hits the air, many of us are prepping our homes, cars, and selves (better get out those hats and mittens) for another long winter. 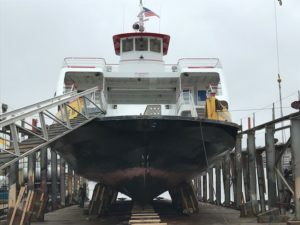 Just as you make sur e you have a shovel at the ready and heating oil in the tank, Casco Bay Lines is bracing for winter and planning its annual fleet maintenance. Each of our vessels is hauled out of the water for a complete US Coast Guard hull inspection every two years. This keeps our beloved ladies chugging along year after year, season after season. We intentionally schedule this for the middle of winter to accommodate the larger crowds in summertime. And while the boats are out of the water, we use this time to complete regular maintenance and make sure everything’s in tip-top shape. For the past several years, our boats have traveled up the coast to the seaside town of Rockland for their winter tune-ups. Our crew delivers each boat to the shipyard, and then we get a little help from Mother Nature and an engineering marvel to hoist her out the water. It’s quite a sight. Then, the team quickly gets to work on routine maintenance and preparing the boat for the Coast Guard’s inspection. This routine shipyard maintenance can include anything from pressure washing grass and barnacles off the boat to ensuring that the boat’s sewage tanks are in working order. And this is all done outdoors in winter weather conditions. Turns out, there’s no garage quite large enough! You might be surprised to learn that one of our biggest challenges each year lies in the process of repainting each boat. In addition to painting the topside, special attention is paid to ensuring the hull can withstand two years of seawater corrosion before its next excursion onto dry land—the paint on the hull is a critical piece of the anti-corrosion puzzle. 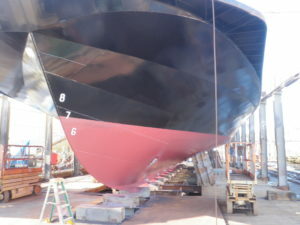 The specialized paint needs a certain temperature to cure so the shipyard crew needs to work around the cold weather and snow to keep the fleet looking its best. We plan for a full repaint of the hull, from the waterline down, each time we have the boat out of the water. While we’re down there, we make sure to check the propulsion shafts, rudders and propellers, and replace all of the zinc anodes—sacrificial pieces of metal that counteract galvanic corrosion on the hull—on the bottom of the boat. Of course, maintenance doesn’t stop when the boats end their winter vacation at the shipyard. Maine winter conditions don’t take it easy on equipment. A triad of Casco Bay Lines maintenance team members performs regular preventative maintenance checks and makes small repairs on our boats every day. Daily tasks for this small, but mighty, team include regularly scheduled preventive maintenance items such as repairing doorways and gates, replacing alternators or pumps, and checking out anything else that needs fixin’. Because our boats run from 5 in the morning to nearly midnight each day, much of this work is squeezed in between trips or done early in the morning. Phew, I’m tired just thinking about all the work! I guess I’ll complain a little less while I’m buttoning up the house and putting the snow tires on the car. This winter, two of our ferries are headed for dry land for a short period of time. During that time, the schedule will be slightly adjusted. We know that the longer our boats are out of the water, the more impact our island communities feel, but our maintenance schedule is critical to keeping us up and running strong year-round. As always, we will keep you posted when this year’s dry docking is scheduled to start.